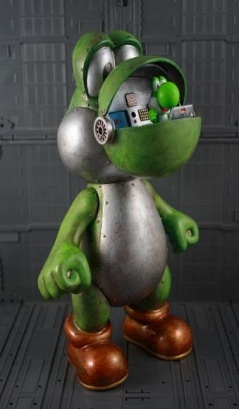 Yoshi built a mech in his own image to prove he's the toughest imaginary dinosaur once and for all. Over the years, Yoshi has been a trusted friend, partner, and ally in the war against Bowser. His success and popularity might have gone to his head, as he's now typically found piloting a giant robot that looks just like himself all over the Mushroom Kingdom. This Yoshi mech is the latest creation of KodyKoala, and is a follow up to his previous Mario mech. Both were created as part of a series where the artist re-envisioned the Mario characters piloting mechs of themselves, perhaps to fight in a Super Smash Bros.-style tournament. It's an ingenious idea, really. As much as I'd like to say that the mechs were created in a forge by a grizzled blacksmith hammering away on red-hot metal, they're actually vinyl dolls. Heavily altered vinyl dolls, but vinyl dolls nonetheless. They've been scuffed and shined up to look like robots, with rivets and other mechanical parts added to complete the illusion. KodyKoala also purchased smaller Yoshi and Mario toys to place in each respective cockpit. You can view KodyKoala's entire photo sets of the Yoshi mech here and the Mario mech here. KodyKoala's website is also filled with tons of other videogame creations and just plain awesomeness, so I'd recommend checking it out too.